Finally, New York City offers an all-day ‘hackathon’ for marketing and product development. StrategyHack, organized by The Inventure Co., brings together marketers and early-stage startups for a day of hacking together marketing strategies. The first Hack was hosted in March and the second has been planned for June. Applications are open to marketing strategists and startups until May 26th. The first StrategyHack brought together ten startups with twenty-nine marketing strategists and three expert mentors for an afternoon of valuable marketing and product development. Each startup was carefully matched with three marketing specialists and was also given private sessions with industry experts, including Mattan Griffel of GrowHack, Bill Smartt of Smartt Talk, and James Bruni of Bruni PR. Organized by Peter Crysdale and Aimee Styler, the idea for StrategyHack grew out of Crysdale’s experiences doing marketing strategy consulting for startups, and discussions with other marketing professionals eager to learn more about the startup world. This was a learning experience for the organizers, too. “When we began planning this event in January, we were hoping to get five really great teams to participate,” said Crysdale, who is also founder of The Inventure Co. “We felt the price points had been set at a reasonable level, but doubted that we could convince enough teams to pay for an event they’d never heard of before. We ended up getting thirty-five product applications and accepted ten teams. Jonathan Chen, a participating marketing strategist, attended precisely for that reason. He jumped on the opportunity to start learning more about how startups view marketing. “Our largest uncertainty was whether marketing strategists would be incentivized to pay the $20 to participate, but we ended up selling out of ‘marketing strategist’ tickets more than a week before the event,” Crysdale added. Each of these startups worked all day, then gave presentations about what they learned and what improvements were made to the product. Cannonball is an add-on to Google Calendar like Mailbox is an extension for DropBox. Centzy is a price-based search engine for local businesses. Conductrics offers advanced testing and optimization tools for online applications. Cookbook Create is an online service that creates print-on-demand versions of original recipes. Coupons at Checkout is a browser plug-in that provides coupon codes during the online checkout process. RoomHints is a mobile app that connects designers with people who are looking for furniture and design help. The Shoplift is a website that does for shopping what Twitter does for news. Standbuy is a crowd-funding platform specifically created to ease the financial stresses of cancer. Tawkers is a website and mobile app that facilitates public conversation and helps establish thought-leaders who are interested in creating original content. TripCommon is a platform that decreases the hassle and price of arranging travel with groups of people who don’t live near each other. Not too shabby for the first StrategyHack, and the team is working on improving the event for its second round. Tiff Wilson of RoomHints expressed one possible improvement. She was frustrated because her marketing strategist had conflicting expectations going into the afternoon. “My strategist didn’t know a lot about early stage startups. She mostly had experience working with corporations, but working with American Express is a way different animal. Creating a 3-month marketing and positioning plan is awesome, but my whole strategy can change tomorrow morning if 50,000 new downloads submit pictures of something outside of our current focus,” said Wilson. For her, it’s more beneficial to create an abstract and simple marketing strategy. 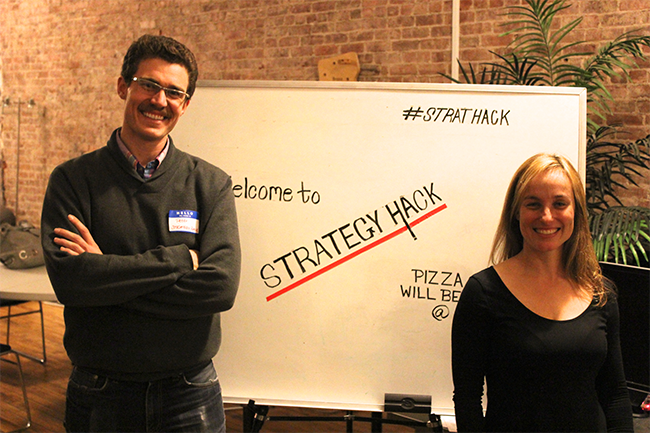 StrategyHack hit an untapped nerve in the NYC startup and marketing communities. The word is out and expect strong responses from both product developers and marketing specialists. And no doubt an even bigger turnout, next time around.